We couldn't have asked for a much prettier day to see you off, Tom. It was the kind of Sunday gem that brought us west from a cold climate back in the heady dot.com days. The sky was clear and blue, the sun was smiling, the temperature was in the low '60s. As if a compassionate Mother Nature were purposely easing our passage through this trying ceremony. Our journey began in the bay, where the water was calm. In accordance with your final wishes, we went to the ocean. the city you loved and called home for most of the last seventeen years. we left the cabin and congregated on the back deck. as was this single rose. All too soon your sudden passing was that much more final. I love walking around San Francisco with a camera on my days off. These excursions tend to be spontaneous. I wake up, it's gorgeous outside, I have no pressing deadlines, I map a route in my mind and head out. Once in a blue moon, I post the photos the same day, or get some shots that I know will be a good fit for a future photo essay, but it's usually a one-off experience. I return home after the sun sets, delete duplicates, and upload the rest to my computer, where they take up space. For this post, I'm raiding the vaults to rescue 46 photos for public consumption. The opening photo was taken on Mission Street, early in the morning. I like the messiness of this shot, which has a smorgasbord of signs and colors crammed into a small frame. The man with slicked back hair is setting the backpack on one in a series of hooks that hang over the storefront entry. Bernal Heights Hill looms in the upper-left corner, just beneath the streetlamp. Here's the view from Bernal Heights Hill, looking on the Mission District. Several hundred murals are on display throughout the Mission. The mural below graces the corner building at 25th and Bryant. A few blocks away is "Amor Indo." San Francisco's population is a multi-ethnic stew. "El Inmigrante" reflects the Latino flavor of the Mission District. Art fills a number of alleys in the Mission District. This photo was snapped in Clarion Alley, between Mission Street and Valencia. Also in Clarion Alley is a mural of Dr. Martin Luther King, Jr.
before mysteriously burying it under a coat of boring gray paint. in the Valencia corridor, between 23rd and 24th. A companion stencil on Bartlett, a block over. One block west of Valencia is Lapidge Street, home to the Women's Building. Nobel winner Rigoberta Menchu's got the whole world in her hands. Dolores and 18th while their color-coordinated friend sits inside the Dolores Park Cafe. I'm not the only person getting in on this action. Parallel jet streams trace the sky over Dolores Park. one of the many sets of stairs carved into sheer drop-offs in San Francisco. Around the corner, in Eureka Valley, are the Cumberland Street stairs. Cars pass, and sometimes people. (steep enough to warrant its own gradient sign). has a number of homes with gingerbread trim. including these fine turreted specimens on Center Avenue. The Haight feeds into the vast playground of Golden Gate Park. Here, some Russian men play checkers at Spreckles Lake. West of them is a trail that runs along the northern edge of the park, through the woods. 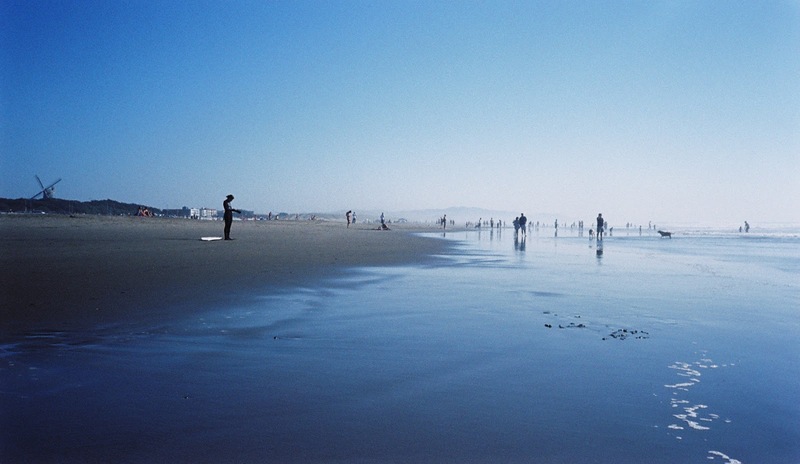 Down the road from the casting pools is Ocean Beach. This concrete wall separates the beach from the boardwalk. A coastline, saturated in blue. All the way across town from the ocean, on the bay, is a plaza behind the Ferry Building, a San Francisco monument. The Bay Bridge is in the background. The Ferry Building is near the foot of Broadway Street, which takes us to North Beach, best known for the Beats. This photo of Neal Cassady and Jack Kerouac was in the display case at City Lights Bookstore, the heart of North Beach. with literary cred, a quality jazz soundtrack, and this mural along its side. Overlooking North Beach is Coit Tower, which has a panoramic view of the bay. where "The Wild Parrots of Telegraph Hill" was filmed. Just down the hill from Coit Tower, on the other side, is the Saints Peter and Paul Church. North Beach is next door to Chinatown. In this photo, men play Chinese checkers at Portsmouth Square. Chinatown abuts the Tenderloin, one of San Francisco's most colorful neighborhoods. This is the last block of Golden Gate Avenue before Market Street. The Tenderloin has a lot of multi-story brick buildings like this one. as are catwalks which remind me of Little Italy. The Tenderloin is Grand Central for pigeons. Here's a bird's eye view of the waterfalls at the U.N. Plaza. which recently got a new paint job. "WORLD CLASS THEATER THAT DAZZLES AND TRANSFORMS US THROUGH MUSIC, DRAMA, AND JOY, SHOWING US THE WORLD THROUGH FRESH EYES." land of pink sunset skies.